Christmas is a big thing on the cocktail bar industry calendar, with many bars around town specially creating festive tipples to celebrate that holiday. Far less important is Chinese New Year a month or so after; perhaps because of the extended off-season bars may be less enthralled about specific Lunar New Year offerings. Not Nutmeg & Clove, though – owner Colin Chia is a big proponent of remembering his ancestral roots and pays tribute to Chinese New Year with three different festive cocktails for the season. All three cocktails are inspired by the flavours of Chinese New Year. The first is 牛车水 ($18++, main picture), or the Chinatown. Chia’s grandparents used to own a shophouse in the Boat Quay area and traded in spices – which, of course, explains the bar’s name – and during Chinese New Year the area would come alive with people shopping for festive produce. One of these Chinese New Year treats, sold all over nearby Chinatown, was bak kwa, or Chinese barbecued pork jerky. And where New York has the Manhattan, Chia gives the classic cocktail a Chinatown reinvention. Bulleit Bourbon is infused with bak kwa from Kim Joo Guan, and then combined with sweet vermouth and Chinese shao xing wine for a powerful, spirit-forward drink with a slight smoky charred umami from the jerky. For a sweeter and easier-drinking cocktail, there’s the Huat Ah! ($18++, above). This is an aperitif, a low-alcohol long drink that is equal parts sweet from the use of mandarin oranges – those lovely fruit orbs exchanged during Chinese New Year as a greeting – and equal parts bitter from the use of Campari. 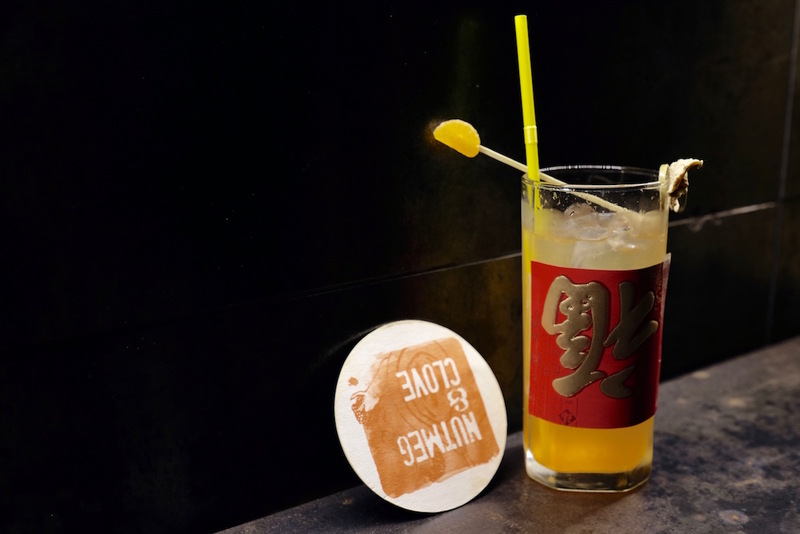 Finally there’s the Prosperity Flip ($18++, above), which takes the traditional Chinese pineapple tart pasty and reimagines it as an alcoholic drink. Chia’s family spends much of the weeks before Chinese New Year making pineapple tarts, and he salvages the scraps to make the flip, along with Bacardi Carta Blanca rum and egg white. Nutmeg & Clove serves a limited number of this cocktail, depending on how much pineapple scraps he can get his hands on. 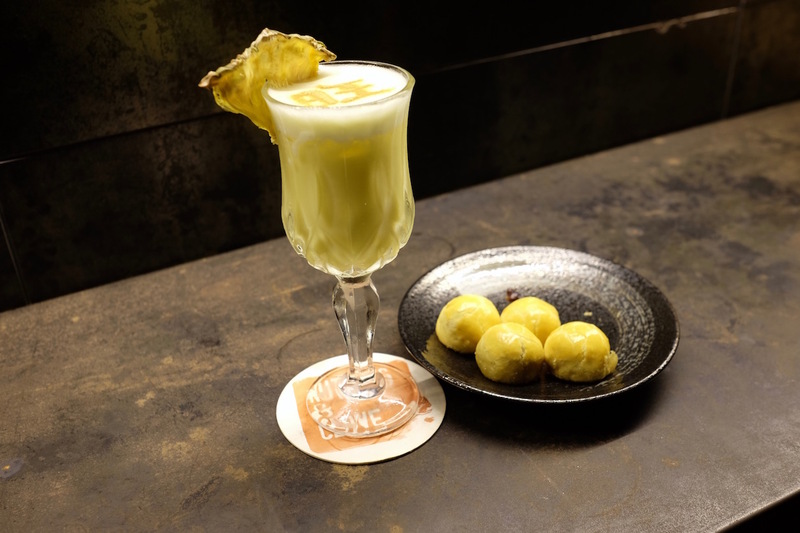 But if you don’t fancy Chinese New Year flavours – you uncultured savage – Nutmeg & Clove has an entire cocktail menu devoted to detailing Singapore’s history. You can find, for example, the Old Harbour ($22++), which is a hat-tip to Singapore’s beginnings as a trading outpost; otherwise there’s the Good ‘Ole’ Fashion Revolution ($22++), a Nasi Lemak take on the classic Old Fashioned. Our favourite though, has to be the Tsukiji Fizz ($22++) – this version of the Ramos Gin Fizz uses squid ink for a lovely umami punch. So if you’re looking for a place to celebrate the Chinese New Year festivities without being stuck in the Chinatown crowds, Nutmeg & Clove has got you covered. You can find Nutmeg & Clove at 10 Ann Siang Hill.